Join the discussion on our forums! Come discuss Corrupted Seer over in our dedicated Corrupted Seer discussion topic. Battlecry: Deal 2 damage to all non-Murloc minions. For seers, it's very handy to have your crystal ball hanging right in front of your face. After the Murloc update: Deal 2 damage to ALL non-murloc friendly minions. I've found moderate success with this card in my Menagerie Druid deck drawing it from Curator. The ability to potentially board wipe with a single card makes it a great addition that has saved a significant (20-30%?) of my games from being lost. I know that it'll damage my board as well, but if I'm in a position where I absolutely have to play it, I'm probably playing with an empty board or I'm trading my nearly-dead minions to kill them off with the board-wide 2 damage. You could argue that it's basically Starfall, but I believe that the ability to draw it on demand from the Curator justifies its place in my Menagerie Druid. Plus, for only one extra mana, you do get a nice 2/3. Some nice value. 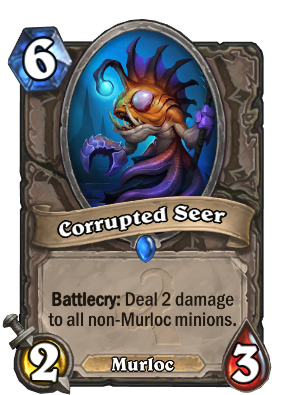 Oddly enough, "corrupting" murlocs with tentacles and pincers makes them seem more normal than having hands and opposible thumbs. I use it in my control paladin deck currently. It does not have any other murlocs. I use it as an extra AOE that gives me a 2/3 at the end. Its good when you are behind but not amazing. It allows me to drop 2 dmg AOE without using up a consecration. This is actually really good in Arena, specifically when you run warrior since Warrior as weaker AoE, with the exception of Revenge (which needs the 12 health trigger). It activates enrage, clears board when you behind, DESTROY's every aggressive deck I've played in Arena, and is definately unexpected. Its a good AoE for classes which lack AoE. Certainly overcosted for a kinda Consecration paired with a generic 2 drop in one card. I ended up with this in an arena run and was all WTF, but found it good to have a board clear. I'm trying to make it work in a deck now as a third consecration, but not sure it's worth the effort. This card is a grave offense to Murlockind. Maybe this could be used in rouge because Blizzard nerfed Blade Flury into the ground but probably not. Well, Murloc decks look even better now in Wild. Sadly this is not even close to a good replacement for Old Murk-Eye in Standard. Well damn. I guess that means no more parrot either then lol. So weird they did it that way. Deal 2 damage to all non-seafood minions. asumming you have mostly murlocs and your oponent has mostly non-murlocks it is like conscration with no face damage. 6-4=2 2cost 2/3 = decent.